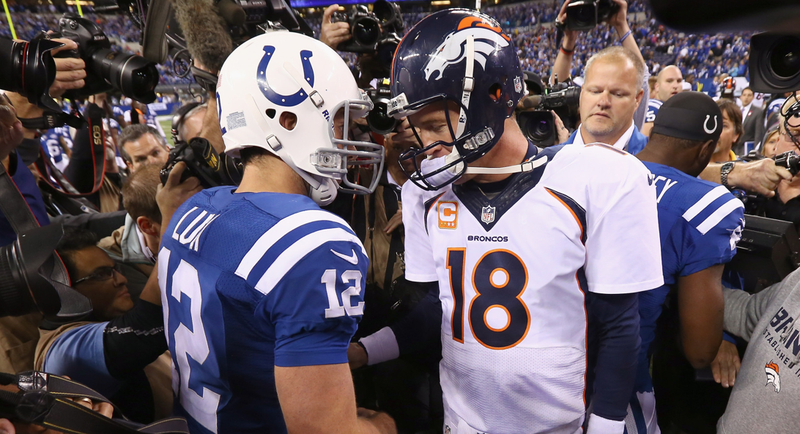 Time to bust out those stupid two-team jerseys Indy fans, your Colts are playing Peyton this week! Four down, seven to go. With that said, there's a whole new slate of games this week, featuring four teams we saw last week and four teams we didn't. With the AFC slated to start first this weekend, we kick off our coverage with the opening game Saturday. LaFell is questionable with a toe injury. Edelman is probable with a thigh injury and is recovering from a concussion, but also missed both of New England's last two games. (Worth noting that he only sat because Week 16 was against the lowly Jets and Week 17 was after the Patriots had already clinched the No. 1 seed, and it's safe to assume that he would have played had it been a postseason game.) Both are expected to play, but it's possible that both will be limited. That's pretty important, considering the weakness of the Baltimore defense is their banged-up secondary. If LaFell and Edelman are hampered, what once might have been a big edge for the Patriots might end up playing to a draw. Edelman is the key here. Baltimore's pass rush is among the league's best, so it's going to be up to Edelman to give Brady an outlet option on short passes before the pass rush can get home. If Edelman can get separation on quick outs, slants, and screens, the Patriots should be able to move the ball pretty easily. Elvis Dumervil is Baltimore's All Pro pass rusher, rookie C.J. Mosley has already earned the nickname "Half-Man, Half-Amazing," and Suggs didn't even get a sack in last week's win over Pittsburgh. But, make no mistake about it, "Hacksaw," a proud alum of Ball So Hard University, is still the most important guy in the Ravens linebacking corps. Constantly pushing the line of scrimmage back against the run while generating pressure, and doing a pretty fine job in coverage, against the pass, Suggs is who Tom Brady will have to watch out for each play. With a beaten and battered secondary, and Dumervil sure to garner plenty of attention, this just seems like the kind of game Suggs will have to take over if Baltimore is to slow New England down. After a dominant performance in Pittsburgh last week, it will be interesting to see how the Patriots handle Suggs playing at his highest level I can remember. No duo in the league has been as good at drawing pass interference calls as Baltimore's Joe Flacco and Torrey Smith. Smith's 11 PI calls drawn for 229 yards is by far the most in football, making his season receiving totals of under 800 yards look a whole lot better. Smith and Flacco were so good at drawing pass interference calls (and deep ones, as they averaged 21 yards per penalty), that the next best duo in the league, Green Bay's Aaron Rodgers and Jordy Nelson, came in at a measly 6 PI calls for 129 yards, just over half of Flacco and Smith's penalty production. What does this all mean? Well, it means it could be a long day for a Patriots defense that has committed nine pass interference penalties this season, tied for third-most in football, and corner Brandon Browner, who has committed five of those offenses, good for fourth most in the NFL. Browner has long been known as a physical corner, but he sometimes gets a little too physical. The powerful defensive back also has four defensive holding penalties to his credit, helping New England lead the league in that category with 14 defensive holds in 2014. Since the Patriots will likely turn to Darrelle Revis to shut down Baltimore's top receiver Steve Smith, we could get a match up of Torrey Smith and Browner, something the Ravens have to feel good about when pushing the ball down the field. With the Ravens leading the league in PIs drawn, led by Smith's downfield battling, look for Flacco to go to his patented "chuck it and pray" strategy, and likely get bailed out by a call or two on third down. Defensive penalty numbers via NFLPenalties.com, and individual pass interferences drawn via FootballOutsiders. The Ravens [expletive deleted]ing terrify me. The wounds are still fresh from 2012. And this Baltimore team is better than they seem to be getting credit for. Their stout run defense should be able to (at least) marginally disrupt New England's secretly-anemic-of-late ground attack. New England's passing attack will come down to how well they can exploit the short and intermediate field. They don't have a true deep threat (save for Gronkowski running down the seam), and even if they did, Baltimore's pass rush probably won't let Brady sit in the pocket and throw deep against Baltimore's suspect defensive backfield. Gronkowski on stick routes, Edelman on outs and screens, and Shane Vereen running to the flat will be the difference in the game. Baltimore depends on two things - they need their pass rush to show up, and they need Good Flacco to show up. Very quietly, Flacco had his best season since 2010, and he's been on fire lately, excluding one dud he had against Houston. Flacco has won his last five playoff games and done it with a QB Rating north of 115. But he hasn't gone up against a secondary quite like New England's, and he'll be standing behind a banged-up offensive line. I think it'll be a closer game than the matchups might dictate, but my money is on the Patriots pulling through. Sorry, I'm not buying this Patriot fan fear of Baltimore. True, the Ravens played well last week against an undermanned Pittsburgh team, but prior to that Baltimore was losing to Houston and having trouble with Cleveland's third-string quarterback. The Ravens are very tough up front on both sides of the ball, but New England will likely go back to the quick passing it utilized against teams like Detroit to exploit a weak secondary and aggressive group of linebackers. When Baltimore has the ball, I think the Flacco playoff bandwagon comes off the tracks this week. Flacco was pretty good against Pittsburgh, mostly because the Steelers couldn't stop the Baltimore ground game, opening up WIDE OPEN passing lanes late. I don't expect either of those things to happen against a better New England defense, and I have to think that Bill Belichick will have a few tricks up his sleeve for the QB that handed him one of the most painful losses of his career. The Colts have had some ugly games against opposing running backs. They're 23rd in opponents' yards per carry, and Football Outsiders ranks them just 19th in run defense. Anderson, meanwhile, has been on a tear of late, averaging 108 yards on 4.6 yards per carry over his last six games while Peyton Manning has been shockingly below-average over a similar timespan - posting a QB Rating of just 78.7 over his last five. The Colts don't have the dominant pass rush of old, but Vontae Davis and Mike Adams anchor an underrated secondary and could cause some problems for Denver's passing game. If that's the case, it will be up to C.J. Anderson to shoulder the lion's share of the offensive load, and he's proven to be a capable feature back over the second half of the season. While you can argue his credentials as a "shutdown corner" until you're blue in the face, there is no denying the importance of Davis against Denver's incredible receivers and tight ends this week. Davis, like Richard Sherman of the Seattle Seahawks, doesn't follow around the team's best receiver. Rather, he simply plays the right side of the defensive formation and covers whichever player makes his way out there. And whomever that has been for the Broncos the last two years, they haven't had much success. In his last two games against Denver's highly-touted receivers, Davis has been targeted 13 times, allowing just four catches for a measly 17 yards. Earlier this year, Davis was matched up with both Emmanuel Sanders and Demaryius Thomas, and held that dynamic due to just one catch for five yards. Perhaps Indianapolis changes things up a bit this week and lets Davis shadow Thomas, or the Colts are happy to keep Davis on the right side. Either way, his performance will go a long way toward determining the outcome of the game. Don't look now, but Denver's Special Teams are abysmal. Connor Barth has been a capable field goal kicker since taking over mid-season, but every other Denver Special Teams unit is among the worst in the league, particularly their punt and kickoff coverage. In fact, if you look at their losses, you notice a startling trend - they tend to have terrible days on special teams. Against Cincinnati, they surrendered an 80-yard kickoff return and a 21-yard punt return to Adam Jones and a 49-yard punt return to Brandon Tate. Those three plays led to 13 Cincinnati points. Against St. Louis, Britton Colquitt averaged just 36.6 yards per punt on five kicks and the Rams started their drives at the average of their own 32.6 yard line (compared to the 17.7 yard line for Denver). Against the Patriots, they surrendered an 84-yard touchdown on a Julian Edelman punt return that put New England up by two scores. The Colts don't have any dynamite special-teams units (Indy's biggest plus in special teams is their field goal kicker, which Denver can't do much to affect besides playing the game outdoors, but Denver's thin air might as well make that a wash), but if the Broncos commit a serious blunder, it could swing the game. Yes, Denver has poor special teams, but it has only greatly affected them in three games out of sixteen. Odds are, it won't be a game-changing force in this matchup. Meanwhile, Peyton Manning's foibles may be overstated - yes, he had seven "bad" games this year, but they've come against three of the most dominant pass rushes in football (St. Louis, Kansas City and Buffalo), one juggernaut (Seattle), one other elite secondary (New England), one game where his worst plays came in desperation situations where he either had to try to force a play or lose the game anyway (Cincinnati), and then the last game of the season (Oakland). When he's been comfortable, he's been lights out. And with Indy's porous run defense against a budding star in C.J. Anderson, Manning doesn't even need to be his normal all-world self in order for the Broncos offense to bleed clock and put the game in the hands of their great pass rush and secondary against Andrew Luck. I just have a feeling this one is close. While I'm not brave enough to call for a Colts win outright (and I thought about it), I need to see another signature Peyton Manning performance to really start believing in Denver again. Right now Manning just doesn't look right physically to me, but I'll give him the benefit of the doubt at home and with an extra week of rest. At the end of the day, though, I really think this game just determines who will lose in Foxboro the following week, unless Manning suddenly reverts to 2013 form.